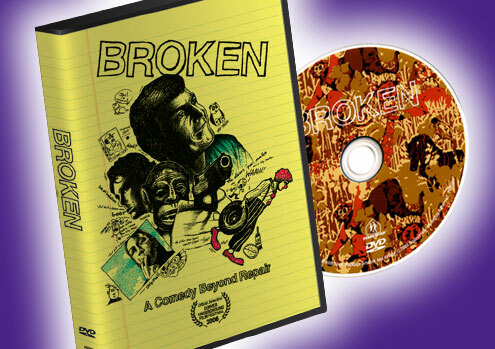 In keeping with the month ending lamb-wise, the hotly anticipated DVD release of my feature Broken saunters lazily onto Amazon.com today, March 20, 2008. I was thinking about working a sidewalk sale across from Greeley Square to push a Genesis reference (because, really, you can’t have enough Genesis references) but I figured, A. It would be way too cryptic and, B. I’d have to contend with the pirates who have the entrance to the Manhattan Mall pretty well occupied. And, as an extra special bit of supersized madness, Amazon.com soon won’t be the only place to find the DVD. Within the next 2-3 weeks, Broken will be available directly from the Pedestrian site: http://www.pedxing.com&#8230; as a Deluxe Limited Edition with Board Game! Yes, you read that correctly.